The weather is warm, and the sun is shining in golden, glorious perfection. The long winter months are a distant memory, and the dog days of summer and sweltering heat haven’t yet arrived. June in the Great Lakes Bay Region is the material that daydreams are made of. Celebrate the weather, and set forth to full-throttle fun with a day of boating on the gem that is the 1,143-square-mile Saginaw Bay. 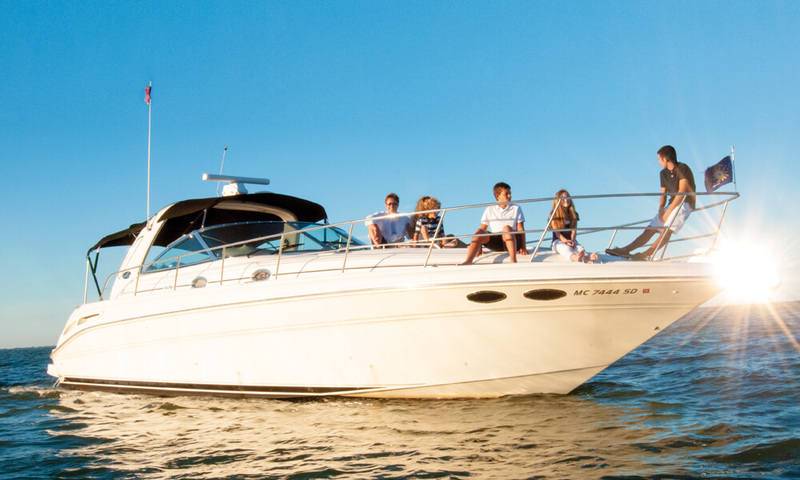 We’ve got the perfect, step-by-step guide to boating enjoyment. Bask on the boat’s bow, or go for a swim at Boater’s Beach. Prepare your freshly-caught fish for dinner, or dine at Dockside. Feel the wind in your hair, enjoy the sun on your face, and savor the moments of laughter and fun with your boating crew. It doesn’t get much better than this! Pack your cooler. 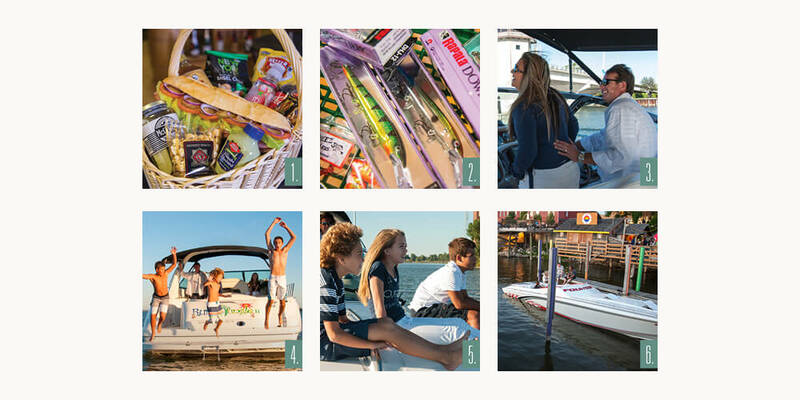 Before hitting the open water, stop by Waterfront Market (925 N Water St, Bay City, 989-891-1330) to stock up on provisions. The market has more than 30 deli sandwich offerings, including the 3 Brothers Italian Sub. American Gourmet pretzels, summer sausages, and pop, juice, and other beverages are also available. Load your choices into coolers and picnic baskets, and you’re ready for fun. Grab your gear. “Good things come to those who bait.” ~ Author Unknown. Andy Gorske, manager of Frank’s Great Outdoors (1212 N Huron St, Linwood, 989-697-5341), says night crawlers are essential for any fishing tackle box, hand-picked “jumbos” are even better, and custom-tied crawler harnesses and custom-color crank baits are good to have on hand, too. And you’re off! The water’s not too choppy, clear skies abound, and everyone’s ready for a day of sights on the Saginaw Bay. Chuck Frantz, president of Pier 7 Marina (963 E Midland St, Bay City, 989-894-9061), says that the old Saginaw River Coast Guard station, located half a mile in from the bay, is worth a stop on your boating trip. Make a splash. Cool off with a dip in the bay at Boater’s Beach, located right by Bay City State Park. The young and the young at heart can frolic and swim, and the park has a 3-acre playground in case anyone’s sea legs need a little land. Relax and enjoy. After a long day on the water, the pace slows down and everyone feels relaxed and happy. Take a seat on the bow with a warm beach towel and a snack, and watch the wildlife swim and soar as the sun begins to paint the evening sky. Dinner time. As the sun sets, grab a bite to eat at Dockside (1019 N Water St, Bay City, 989-894-0772), a Bay City riverfront restaurant. After parking your boat at the dock, dine outside and enjoy the sunset. Don’t worry if your fishing went poorly—Dockside offers fresh walleye each day. The Saginaw Bay is best known for walleye fishing, although you can also catch perch, pike, bass, and an occasional catfish. Andy Gorske, manager of Frank’s Great Outdoors in Linwood, says locating fish by water depth is a common and useful strategy. Schools of fish pool in more shallow areas in spring and early summer and migrate to deeper and cooler waters as temperatures heat up. In June, Gorske says a water depth of about 12 to 15 feet is the sweet spot for catching fish in the Saginaw Bay. He recommends the following locations for prime fishing. Black Hole. Located just north of Linwood, the Black Hole has water depths of about 23 to 25 feet. Cigar. A section of water located due south from the Black Hole, the Cigar is about 18 to 19 feet deep, with a cigar-shaped, underwater hump of land that’s visible by boat. Spark Plug. Located approximately halfway into the shipping channel of the bay, the Spark Plug is about 23 feet deep. According to Gorske, it looks “like a big spark plug sticking up out of the water” and has a blinking light. Callahan Reef. The reef is located toward the Quanicassee and Sebewaing area on the east side of the bay. Buoys 1 and 2. The last two buoys you’ll see on the way out of the shipping channel, Buoys 1 and 2 are deeper spots for later-season fishing. Save room in the cooler! Prepare these boat-friendly, delicious drinks the whole family will love in a pitcher at home—and tote them along. Sweet and tart, this drink is similar to lemonade, but made with limes. Pour sugar and water into a small saucepan. Heat until sugar dissolves. Pour sugar water, lime juice, cherry juice, and club soda into a 2-quart pitcher. Stir well. Add water and ice to fill the pitcher. Garnish each glass with a lime slice and a maraschino cherry. Fresh fruit adds the final flavor to this cool, refreshing tea. Bring 4 cups of water to a boil, remove from heat, and add tea bags. Let tea steep for about 10 minutes. Remove tea bags and add sugar to mixture, stirring until dissolved. Add peach nectar, and stir. Pour tea mixture into large pitcher, and stir in 10 cups of ice water and lemon juice. Add peaches. Serve over ice.